With Prot-On you can protect texts too, for example the body of an email message, a blog input form, or a post on a social network site. – Insert the text that you want to protect, then click “Protect”. – Place your mouse over the Prot-On icon in the message area on the bottom right of your PC screen. – With the right mouse button select “Protect text”. Here you can write or paste text that you want to protect. It will ask you a for a name to use later to help you manage document permissions. 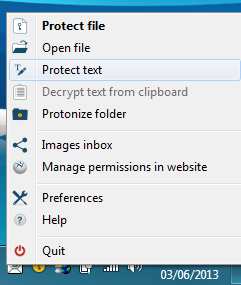 Once protected you can paste the encrypted text wherever you want. Only users to whom you’ve given permission will be able to read it. Access to Manage Permissions Panel and give read permissions. If you use Outlook, you can protect your emails in an even easier way with the Prot-On plug-in for MS-Office which we explain in step 8.